Posted on January 12, 2014 by Michele D.
We’ve all been there. The 6:00 pm witching hour arrives. Dog is barking. Kids are screaming, “what can I eat?” The Head chef (aka, you) has no idea what she is going to make for dinner. There’s no time to go to the store. You have to work with what you’ve got. Which in my case usually isn’t much. 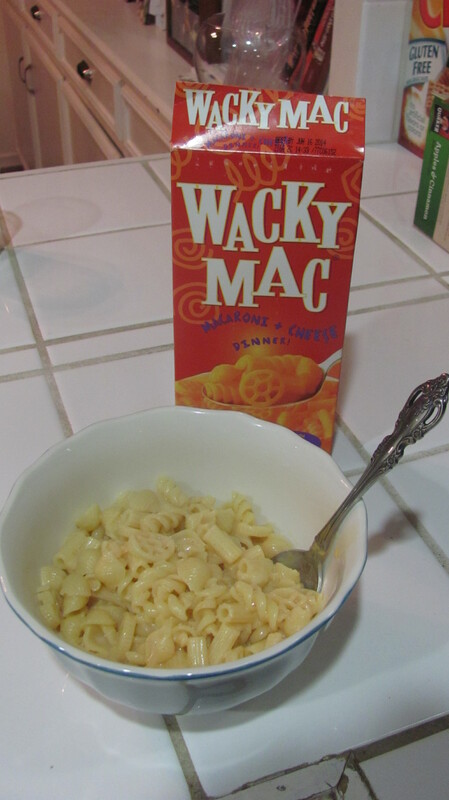 For me, the go-to-dinner for my daughter is usually Wacky Mac. Zoe loves it. It has a lot of protein, and she will eat at least 2 bowls full, along with a few fruits and vegetables. I’ll sometimes add fresh cheese to the Wacky Mac, as well as a small jar of baby food carrots to beef-up the nutritional value. It’s no easy task finding Kosher mac and cheese, other than Wacky Mac. I’ve tried making homemade mac and cheese, but Zoe NEVER likes it. We always go back to Wacky Mac. I recently read an article in Food Business News titled School Nutrition Innovation on Display talking about how various food manufacturers are coming up with more nutritional food options for school lunchrooms. One in particular interested me – Land O’Lakes is planning to offer two new mac ‘n cheese products that approach the new U.S.D.A. standards in different ways – one features reduced sodium while the other replaces semolina pasta with whole grain. I assume these products are for school lunchroom use only, but I’m keeping my fingers crossed that Land O’ Lakes will eventually sell these mac and cheese products in stores AND that they will be Kosher. I reached out to Land O’ Lakes to inquire about the Kosher piece. Will let you know what I find out. It would definitely be nice to have a few more packaged (and Kosher) mac and cheese options. Last but not least, let’s get to the giveaway part. I’d love to hear your go-to-dinner ideas for quick, easy-to-make meals for kids. Deadline for suggestions is Sunday, January 26, 2014. I’ll draw a name from all of the suggestions on Monday, January 27, and post the name of the winner and their kid dinner suggestion at that time, along with info on how the winner can contact me with their shipping information. Good Luck and Happy Kosher Treif Cooking! My quick go to meal is usually something like pizza, made on English muffins or pita bread. Another quick thing that my kids will eat is fine egg noodles mixed with butter and “shaker cheese” aka Parmesan cheese in a can. Not gourmet, but easy and they actually eat it. Inspired to comment because I really enjoy your blog and have tried some recipes and ideas, like the fake crab cakes, thanks! Hmmm, I just commented, but I don’t see it posting, so I’ll try again. My quick meal idea is usually a pizza made on an English muffin or a pita. Another good one that my kids actually eat is fine egg noodles mixed with butter and “shaker cheese”, which is just Parmesan in a lovey can. I can sometimes sneak peas in too, which is good. It’s not gourmet, but at least they eat it. Like your blog very much, I’ve made a few things (fake crab cakes) and taken away some inspiration, thanks! I love both the English muffin pizza and the egg noodles suggestions. Those are things my picky daughter would definitely eat. Thanks so much for the ideas and since you were the only one who commented, you are the winner of the contest : ) Please send me your mailing info to koshertreifcooking@earthlink.net and I’ll send you a fun kitchen gadget. Thanks so much for participating.